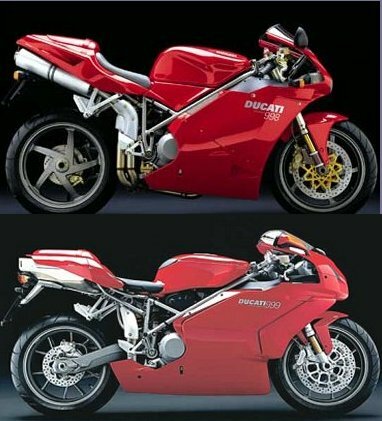 Profiles & initial impressions of the new 2003 Ducati 999 & 749. These should be out in the showrooms by November 2002. 3 models will be available for the new 999: BiPosto, 999S & 999R (homologation special, short stroke 104mm x 58.8mm). Reports say it looks better in the flesh than in photos, go out to a Ducati dealer in November ( in Australia)& see for yourself, because these pix Im looking arent instilling a lot of confidence in me. Sitting on the 999 the tank is lower at the rear & a 6 foot rider is tip-toe on "old" 998 but is flatfooted on the 999. Seat height is the same as 998 but thinner & flatter design of the tank & part of the fuel load is now carried under the seat. Mirrors have adjusters to change mirror setting easier. Footpegs are 5-way adjustable. Screen is now 10mm lower but the rider sits 18mm lower in the bike. The silencer is a single unit under the seat/tail section & in stock form sounds more like a standard Buell (flat blat), not very Ducati-like. Shares the same geometry as the current 998. Wheelbase is 1420mm, longer than the 998. There is a "park light" above the two stacked headlights that is at an angle (following the curvature of the upper screen) where some light is reflected or beamed back towards the rider. This can be irritating during night riding. The exhaust pipes are changed. The "equal-length" approach as used on the 916-998, with the tangle of pipes between the footrests has now gone to allow the change in swingarm from single to double sided & the longer pipe (from the front piston) has a broader (wide-diameter) to balance the tuning. The silencer is now a single unit to gain the volume required to meet the 80 decibel limit. Engine layout has been altered to consolidate the various components into modules to ease servicing. Electric & cooling systems for example can be removed from the bike & worked on the bench. 30th November 2002. Wooh. Just laid eyes on the new 999 @ Moto One In Oakleigh Melbourne. Sure we all know the story of the 999. The spy pix, the leaked sketches those initial pictures in magazines. Then came the disbelief, how can it be so ugly, is this the new Ducati Superbike! ? Everyone whos seen in the flesh early on claimed that the pictures & photos didnt do it justice, we just had to wait to see it for ourselves. By now anyone remotely interested in Ducati has proberly laid eyes on the new 999 & have drawn their own conclusions. There are those on that long waiting list eager for the next new thing from Bolongia and then there are others, proberly like myself, who are attempting to come to terms with what owning a Ducati tomorrow will be like. I dont want to be like a Vincent or Norton devotee looking back at a glorious time that was, extolling virtues once celebrated but now past. Every motorcycle marque has had its peaks & troughs, even Ducati from high times in the early-mid 70s with bikes like the Imola 750SS to those other times of the 80s (Paso anyone?). This might be getting of the subject but with the release of the new 999 & Ducatis dive into white-hot competitive world of MotoGP for 2003, I feel that it might be a year or two before the Ducati marque will be able to claim the racing accolade that it now enjoys. So what do I think of the 999? There are some beautiful things about the 999 but theyre all under that bodywork (urrgg). Testastretta engine, the triple clamps, dash and rims are some notable mentions. The 999 I saw was on a podium amoungst a gaggle of 998s & 748s, new & 2nd hand. The worst bit was proberly the tailsection/exhaust. A lot of engine & frame components are showing and the tail light/indicators are actually bolted straight to the muffler body. I like the metal tube employed to shield the wiring away from the heat (sic), it all seemed like an afterthought. Sure the 748/998 has the numberplate & indicators dangling off the bottom of the tailsection but with the 999 there seemed no attempt to incorporate any of the road legal gear at all. In fact the tailsection cowling seems to be straight off some other bike, stopping short in covering the muffler in any sort of integrated design. And that muffler, my god, shared with may 4 stroke scooters out there no doubt. Saw a recent pic of the MotoGP Desmocedici with what seemed like straight-out pipes or something along the line of the Conti pipes off a Darmah, lets hope that particular idea finds a good home on the 999. What else is bad? Most bodywork related. Gaps everywhere around the lower cowling near the engine, not sure about the louvered parts near the upper front. The rearview mirrors are straight off a Honda Blackbird but with that Mickey Mouse feel of Fiats of the late 70s. The tank is odd, sure lower than the 998 but the groove incorporate in it doesnt extend to anywhere else on the bike (a-la SS). I would be the first to say that the Desmo twin is a work of art, but thats in application not as a visual delight. Having the motor exposed in place in what seems to be no apparent methodology makes it look kind of half finished. Arh, yes youve heard it all before & proberly from those more informed than I, but this is my website, not theirs. Ducati 999. A face only a mother would love? The new face of Ducati's Superbike. Will these headlights go 10 years? 999's silencer is a one piece unit. Tell Ducati what you think of their new 999. Use the link below & post a comment in their forum. Ducati 999 dressed ready for the Info-Strada team? Ducati 999, 748R on a sunday ride. Sunday ride on Ducati 999 & 748R. I had the time to test a 748s and 999 last saturday. Lets start with the 748s . I had one hour to ride it so I took it up to my Favorite mountain road with lots of twisties. The bike handles great , the brakes are fine and the stock supsension is very good. I was surprised how the stable the bike handled at top speed . the engine sound very raw and metallic when you rev it up wow . the stock 748s lacks a bit of low end power so u always have to be in the right gear if u go fast. The only thing I didnt really like was the seating position of the 748. I´m 6,3 and after about 30 min. my wrists really started hurting. Maybe I have to get used to it but it wasnt really my thing . I brought it back to get 999..i couldnt wait. First of all the seating position of 999 is totally different . its perfect. On the first couple of miles I noticed how silent the bike was. It felt smooth fast man its hard to find words for this . switching gears on the 999 is so mmmmmmmmmm yumnmy. compared to my s4 or the 748 this thing really has power . the testastretta engine punches in even below 3000 rpm. It runs just like a dream. I took the 999 on the german highway the aerodynamics are unbelievable. This bike goes around fast bends like its on rails. The setup is perfect . To get to the point : this is the best superbike I have ever ridden . the image shows 999 next to my s4 and my friends 748r. Built around the new Testastretta engine, today's most advanced twin cylinder, the 749S, possesses the form of a pure sports bike: low, long and narrow with exciting components and a mechanical/technical look. The Ducati 749S/749 introduces a new Testastretta engine and utilizes the same advanced technology found on the Ducati 999. A shorter 58.8 mm stroke lowers the average speed of the piston for higher performance and improved reliability. A larger 90 mm bore also allows more space to install large, high performance valves, meaning decreased wear, vibration and mechanical fatigue. The bottom line: the 749s/749 produces 103 horsepower vs. 97 of its predecessor. In high performance motorcycles like the Ducati 749S, design is the result of function over form priorities. Its beauty is conveyed through the attention given to each component and detail. Just as important as the look of the bike is the relationship between the rider and machine. The riding position of the 749S can be adapted to the ergonomic preferences of the individual rider by way of five-way adjustable footpegs - unique in the world of motorcycling. The 749S represents a new vision of the interaction between man, machine and the elements. Clutch Dry multiplate with hydraulic control . Ducati's 998 & the new 999.